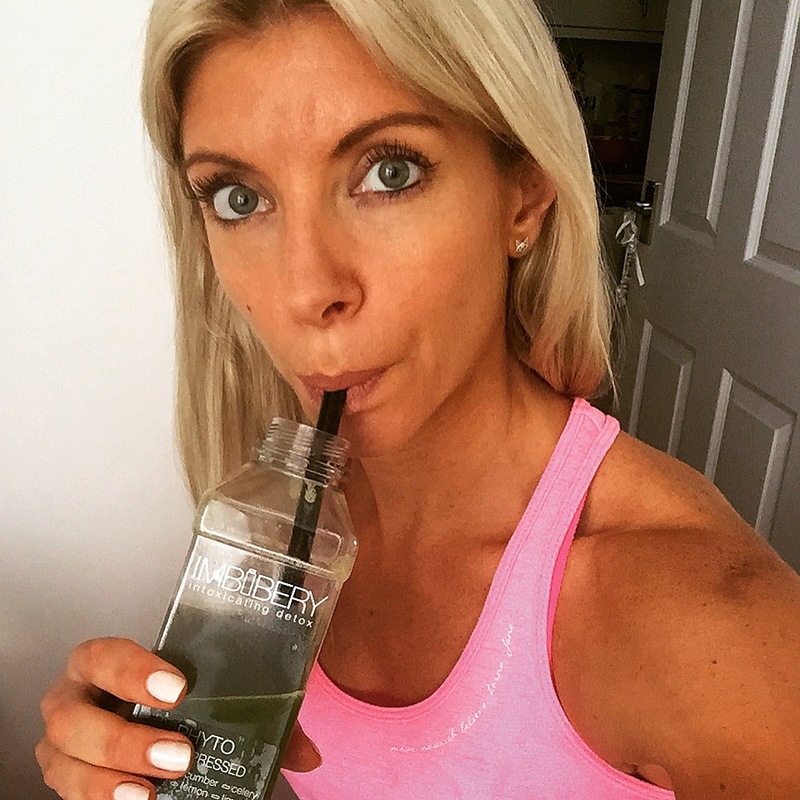 Earlier this year, ahead of my catwalk debut at London Fashion Week for Charli Cohen I undertook my first ever juice cleanse with Plenish – it was hard but I loved the results (click the link to see full details of my experience on that cleanse). Generally speaking I eat well – I aim to eat clean 80% of the time (at least) and try to both track my macros and be aware of my calorie expenditure and therefore allowance every day. However, I also LOVE food, and over the past few weeks there have been many occasions (such as holidays, weddings, family dinners) where my 80% clean rule has had to fall by the wayside, so I decided to embark on another cleanse to reset my digestive system. 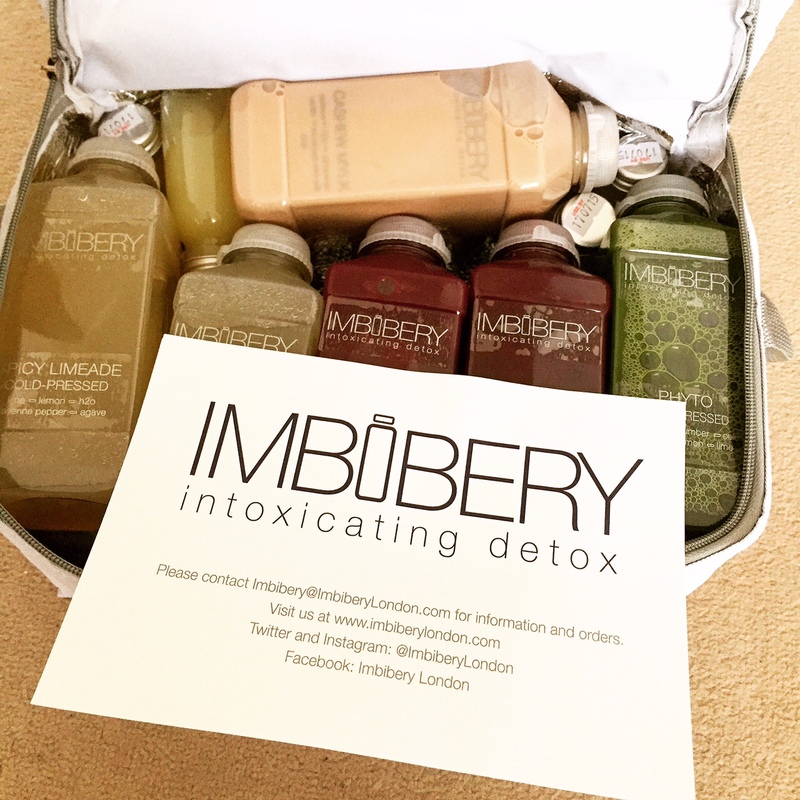 After seeing social media posts about their #Wednesdaycleanseday and #Teamcleanse for July, this time I decided to try Imbibery London and their two day ID2 cleanse. Last Tuesday night I took delivery by courier of a branded Imbibery cool bag filled with 10 juices, 2 mylks and 4 shots to see me through the next 48 hours. When I opened the bag and saw only bottles the realisation did dawn on me that my dinner that night would be my last solid food until Friday morning and I did start to wonder what I had done…. as per Imbibery’s advice of easing into the cleanse I had a light dinner of raw salad (spinach, baby kale, celery, cucumber, radish and fennel topped with lemon juice and a little rapeseed oil) and went to bed early. Wednesday started well. I saw several clients in the morning, follow by a meeting and was only vaguely aware of my hunger. I didn’t feel weak or distracted and given that I hadn’t eaten anything or had any coffee (a big deal for me!!) I was in a surprisingly good mood. During my afternoon break I popped over to a friends’ house which was a nice distraction, but I think I left having juice number 4 (chilli lemonade) a bit too long as by the time I got home I felt weak and wobbly. I had to give in and eat a couple of celery sticks at this point too – I was really lacking both energy and mental clarity and I still had to get through work that night. Imbibery’s advice if you do struggle with no food or start to feel weak is to have some raw vegetables such as celery sticks or cucumber slices, and this definitely helped give me a little boost when I needed it most. As the end of the day approached though I felt okay – aware of my hunger and super exhausted, but I blended my last drink of the day, a yummy cashew mylk, in my Nutribullet with some ice so it felt like I was having an indulgent “mylkshake” before bedtime. I slept well, but the next morning woke up feeling absolutely starving. I definitely felt worse on day two this time than I did back in February – maybe I was more toxic this time?! I felt almost sick with hunger and the thought of having some breakfast crossed my mind several times, but I didn’t – I started the day with warm water and lemon followed by my green breakfast juice and powered on through. I felt mentally very foggy in the morning and was glad I had cleared my clients before lunch – despite a great sleep I had poor concentration levels. However, I really started to pick up after lunchtime (lunch was a delicious beetroot and carrot based juice). That night I was already RSVP-ed onto the In Style UK Babes and Braids event at 1Rebel, and so I knew I was in for a tough workout later on, so at 5pm I ate a salad of baby kale, 1/2 cucumber and 1/2 avocado, and just before the workout itself I had a small handful of almonds. I am almost certain I would not have made it through the workout on juice alone. I was a bit worried about how hard I would be able to push myself during the Reshape class – I had to ease back once on the mountain climbers but other than that I went for it. And I felt AMAZING afterwards! Energised, refreshed and actually strong. I drank my cashew mylk as my post workout snack and felt fine afterwards, and slept brilliantly that night. The next morning I had a light breakfast of watermelon and continued to eat lightly throughout the day – vegetable soup for lunch and salad for dinner in the evening, but I felt fantastic. I taught my Body Attack class that lunchtime with bags of energy and clients were commenting on how lean I looked. The aim of my cleanse was to reset my digestion and nutritional habits, but the best thing in my view? Getting my abs back! Just two days of the cleanse and my waistline looks a lot leaner and feels so much less bloated. Have a look below and see what you think……. Both Plenish and Imbibery were great cleanses and quite similar in terms of contents and juices themselves – I would say I possibly slightly preferred the taste of the Imbibery juices, and the other thing I loved about Imbibery was the shots – as well as your 5 juices and mylk per day you also get two “shots” – one of pure lemon juice and one of lemon, cayenne and ginger. The lemon one was great first thing along with the hot water and lemon to really kick start digestion and the ginger and cayenne was brilliant as a quick energy booster, and it also took the edge off my hunger – a really nice little touch in between juices.